It is no secret that the number 13 is considered to be connected with superstitions. As the festival in 2011 had to be the 13th one blacksmiths had an idea of literally hitting the myths and superstitions with their hammers. Masters worked on art interpretations on the subject of legends, superstitions, myths and mystic fantasies. And, of course, there were exactly 13 creative works by masters from all corners of Ukraine installed in the Mystic Alley. 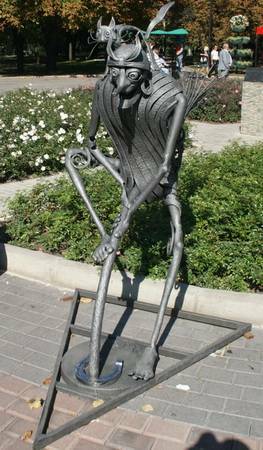 And to prevent all possible apprehensions of the Forged Figures Park’s guests the first sculpture – The Blacksmith-Alien – was decorated with lots of talismans forged at the festival.